This project consisted of creating a series of bespoke school playground features as part of the Camden Active Spaces project which was split over three schools - Torriano Infant School, Torriano Junior School and Carlton School, all of which are managed by the London Borough of Camden. The aim of the project was to develop exciting, inclusive, and innovative outdoor spaces. Key to this was the requirement that these Active Spaces will be open and available to community partners, families, clubs and volunteers beyond normal school hours. 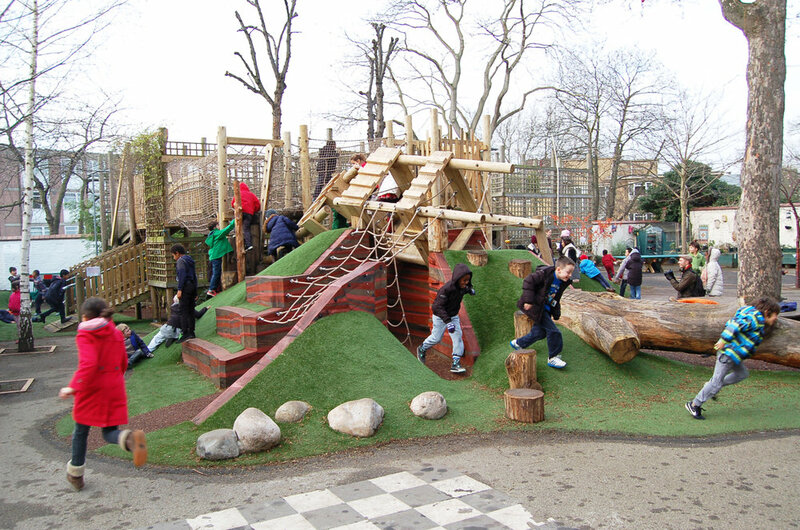 The three different schools each had unique and completely bespoke play features. The play space for this school was named the ‘Earthling Kingdom’ and is nestled in a landscape of mounds into which climbable crevices are cleverly integrated. ‘Earthlings’ explore the overgrown ruined city, which has fallen into their landscape as they move around a wide variety of routes. This feature was built up over the existing playground linking in with a previous structure. New mounds were created with timber retaining walls, netting and a variety of play surfaces. The challenging project began in the school holidays but had to be completed in term time with very restricted access. 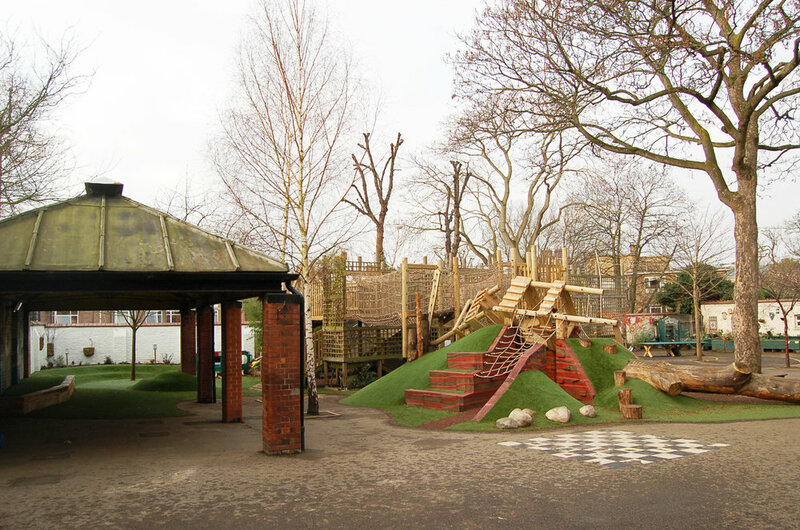 Torriano Infant School playground has become a ‘Cloud Kingdom’. Cloud creatures emerge from a dense undergrowth, bounce from one trampoline cloud to another and scale up into the sky in the white cloud climbing structure. This was built with a bespoke steel structure, clad in netting and ropes, to create this unique design. The Carlton Primary School playground has been settled by a new community created from timber structures. Its rapid growth has resulted in a vibrant collection of overlapping dwellings that form a complex urban landscape that its inhabitants must navigate every day. The entire “new community” was built in a previously unused part of the playground. All of the structures were built on site and the structures clad in a variety of different timbers. The project was started during the school holidays but completed during term time in a busy area of the school.